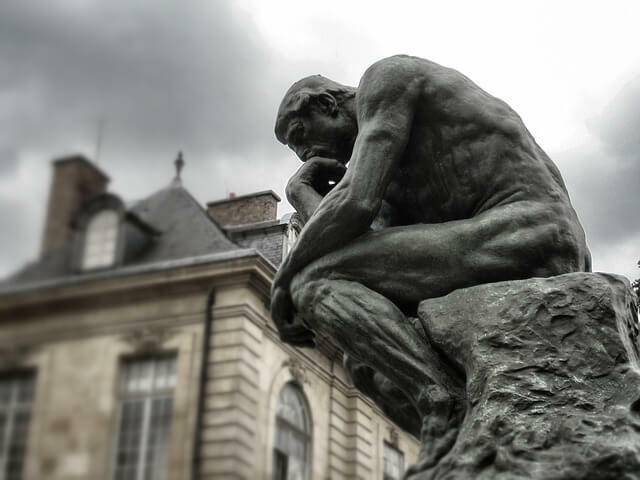 As a full-time van nomad – traveling solo – self defense is a top priority. But carrying a gun isn’t always legal everywhere. Laws can vary from state to state; forget Mexico and Canada. So one of my EDC backups is the Yoogo keychain. I wanted a defensive edge that I knew I’d be carrying every day. A keychain weapon was ideal because I pretty much always have my keys on me. If they’re not in my hand, they’re in my pocket. After looking at a variety of keychain self-defense tools, the particular brand certainly stood out. What Is The Yoogo Keychain? How Does It Work? 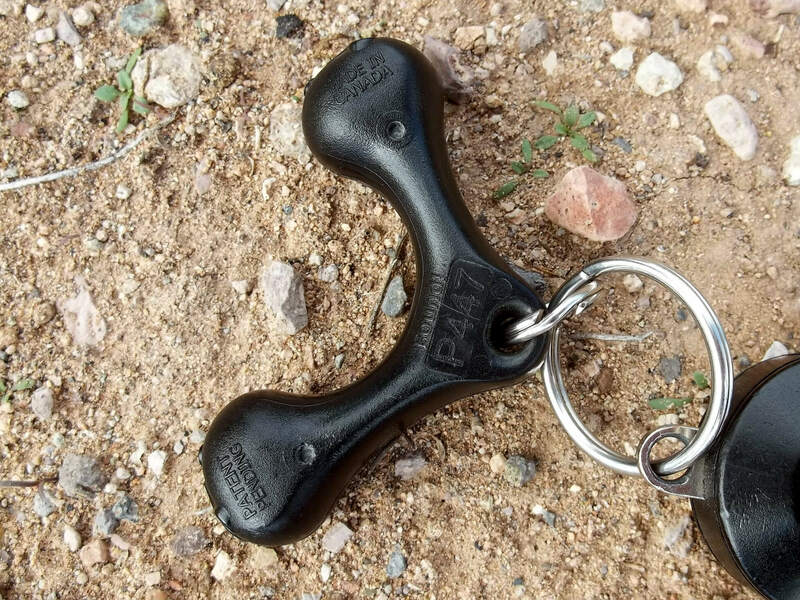 This keychain is a Y-shaped, plastic gadget. It turns the front, top, and bottom of your fists into hard-striking weapons, perfect for pressure points. One Y branch fits ergonomically between your index and pointer fingers. A hard nub sticks out between the fingers. The other Y nub pokes up between your pointer finger and thumb. Your keys point down in stabbing position. Even if you don’t know any martial-arts techniques, it increases the impact of your natural defensive motions. If you do know some self defense, your effectiveness is increased considerably. Your defensive strikes will cause more pain and damage to your attacker. This increases your chances of disabling the attacker or causing them to flee. 1. Punches – The Yoogo nub between your index and pointer fingers concentrates punching power in a small, hard surface. 2. Top-fist strikes – The nub between your thumb and pointer finger lets you swing in at targets from the side at maximum reach. 3. Stabs – Keys in the icepick position let you stab at pressure points. At the same time, the Yoogo Y let’s you keep a secure grip on your keys. They won’t slide back or get jerked from your hand. 4. Slaps – When slapping to the face or ear, the keychain adds a hard-striking surface to your palm. 5. 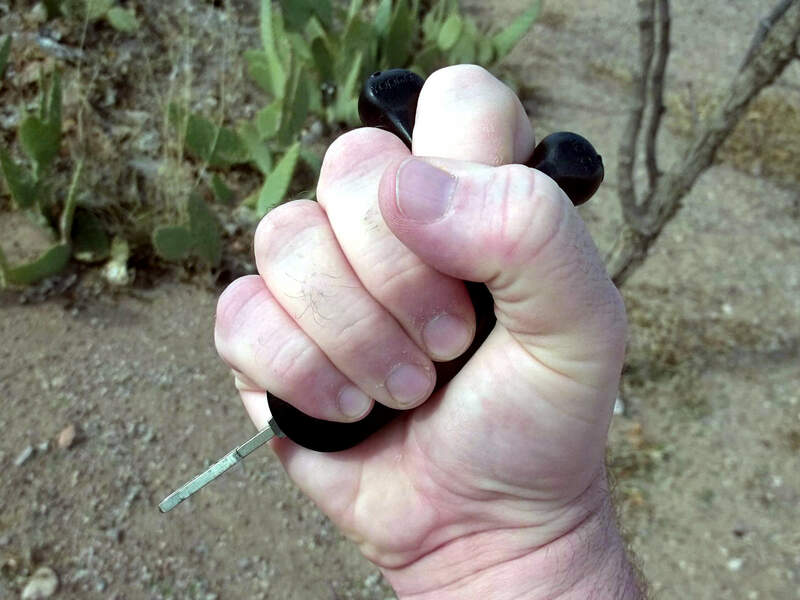 Flails – With the Y secured between your fingers, you can flail keys at vulnerable areas on your attacker, such as the eyes. The kubotan and pepper spray were my leading contenders for a keychain weapon. But the Yoogo keychain won because of its versatility. I’d considered a kubotan, but went with the Yoogo because its small size and smooth corners won’t poke a hole in my pocket or jam against my thigh. Plus, the design secures your keychain in position during the normal use of your keys – and during self-defense. Even where kubotans are legal, they can attract negative attention from law enforcement officers. The Yoogo looks only like keychain, not a weapon. 1. Legal concentrations and ranges of pepper spray vary from state to state. 3. Pepper spray is not good to use in the confined space of my van. 4. Pepper spray would be very painful to my dogs if they got hit. 5. Wind can blow pepper spray away from your opponent, or even into your own face. 6. Pepper spray isn’t effective against everyone. So while pepper spray complements a self-defense toolkit, especially for law enforcement, I chose against it for my EDC toolkit. I just felt I needed something simpler and more all-purpose. Why Is Yoogo Keychain a Top-Quality Product. The keychain is tough enough for the job. The ultra-hard plastic polymer construction can support 200 lbs. at the ring hole. And the metal split rings can support over 100 lbs. I’ve personally punched a seasoned fence post with my Yoogo over and over again, denting the wood. Yet it didn’t chip, and my fingers were only a little sore. I guarantee I was punching hard enough to break my knuckles. An extra benefit of this keychain is the company’s key return service. Each key-chain has a unique serial number, which can be registered to the buyer. If someone finds your lost keys and reports it to Yoogo, the company will get the keys back to you. This service costs you nothing extra. If you are interested in getting one yourself, be sure to check this out. For versatility, the unique Yoogo keychain stands out against other keychain defense tools. It’s tough, easy to use, easy to carry, and something you’ll have with you at all times. Interested? Check Out The Best Price! The mysterious vandweller, known only as “Vanholio!,” blogs about van life, travel, simple living, prepping, and other obsessions at Vanholio.com. This is a great recommendation when guns aren’t applicable in the situation! I definitely agree that this Yoogo keychain is compact and versatile for any event you may find yourself stuck in. Thanks for this post!